Yeah, here it is!! 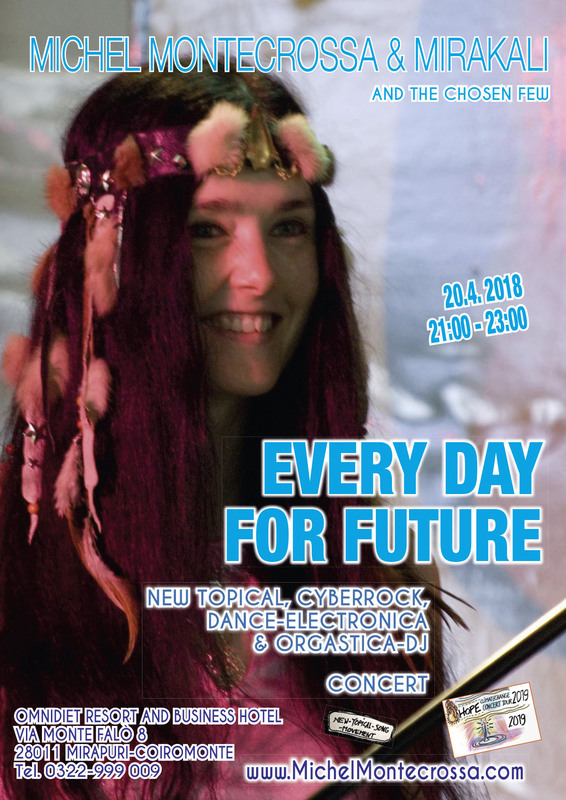 The next concert of Michel Montecrossa’s Peace & Climate Change Concert Tour will be on 3.05.2008 – it is titled ‘Wake Up’ Cyberrock and Slam Poetry Song Concert and will be staged at the Michel Montecrossa Rock Vision Diner in Gauting, near Munich. 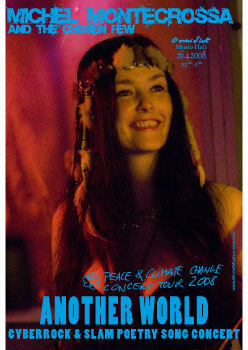 Hier also das nächste Konzert von Michel Montecrossa’s Peace & Climate Change Concert Tour – am 3.05.2008 wird mit Michel Montecrossa begleitet von seiner band The Chosen Few das ‘Wake Up’ Cyberrock and Slam Poetry Song Concert präsentieren. and not of the fall. dass dein Traum niemals stirbt. Liebe ist die ewige Glut. No earth without peace. No peace without earth. I’m takin’ care of you in my way. No earth without danger. No peace without pain. Moist and playful is the dew on your hands. No man without war. No madness without love. Dirt of the dead is in your heart. Your eyes, red with hate, don’t see tomorrow’s grace. Bullets with flesh. Dead bodies cry in gray. You don’t want to hear. You want to stay. You are cheap, you are rich, you know ugly tricks. No wonder all the spirits repossess their earthly gifts. I’m kissed by the wind and embraced by the storm. The temperature is fallin’ and I’m freezin’ to the bone. The farmland is a-burnin’ and everything is wrong. You won’t find the answer if you are all alone. No earth without balance. No balance without hope. I’m takin’ care of you ’cause I see you’re hangin’ on a rope. Nature knows the answer. I can only give you love. Nature is the answer if you want to hear at all. Gerade noch rechtzeitig kann ich euch hier das nächste Konzert melden.